1. The floor. A converted garage is made into a bright and spacious living space. The new concrete floor is raised above street level to keep water out of the interior. More often than not, the existing garage floor concrete slab is sloped, cracked and quite a bit lower than the house floor. So converting a garage to living space usually requires installing a new floor structure. There are several options for doing this. 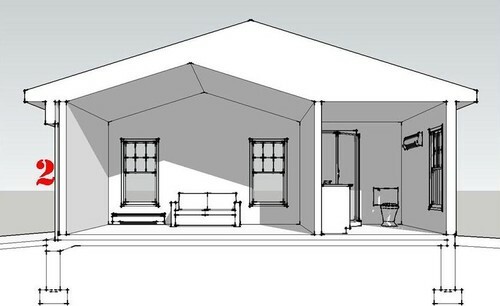 One is to build up a wood framed floor that aligns with the floor in the main house. 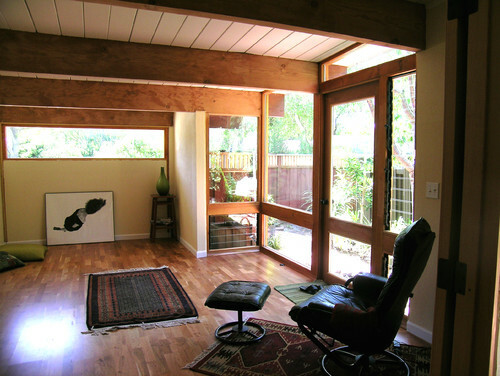 Another is to install a wood framed or concrete floor that is a step or two down from the main house (as in the sketch above). An advantage to installing a concrete “topping slab” over the existing floor is that a radiant heating system can be installed within the concrete. 2. The opening. 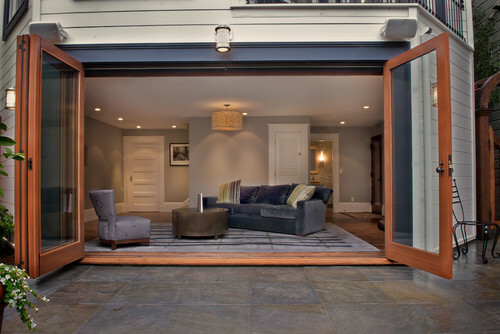 When converting a garage to livable space, there’s always the issue of what to do with the garage door opening. Because this opening and the garage doors have such a large impact on the overall look of the house, it makes sense to fill the opening with a large-scale element. For example, a good solution is to keep a garage door in the opening while making sure the door is weather tight. This is the approach taken in the next photo. Standard carriage-style garage doors are also good options, as they can be a featured element on the interior while maintaining the original garage look on the exterior. 3. Windows. Additional windows will more than likely have to be installed, as garages typically have few, if any, windows. It’s important to check and comply with any local building codes and ordinances when sizing and locating these new windows. 4. Additional plumbing. Adding a kitchen or bathroom to a garage conversion can be difficult because tying into the existing plumbing lines is problematic. That’s not to say it shouldn’t be done as, say, an additional bathroom is always a nice amenity to have. So investigating ways (such as building up the floor to provide a space for plumbing pipes) to overcome the technical difficulties is well worth doing. Some reworking of the exterior walls with full-height glass windows and doors leaves no trace of the original garage space in this conversion. This master suite with a new bathroom occupies what was once a large garage. 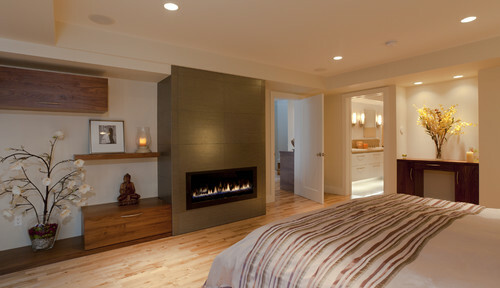 The addition of a the gas fireplace certainly makes the room special. And having the bathroom adjacent to the bedroom makes for a nice master or guest suite. 5. Ceiling height. Though the type of framing used at the garage roof will dictate what can be done economically, increasing the height of the ceiling is a possibility if the garage is free standing or has no second floor above it. 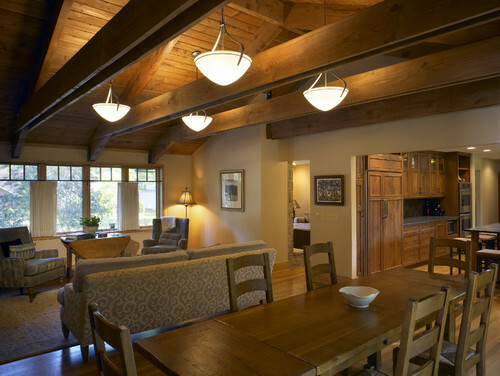 A vaulted ceiling, as in the next photo, will certainly add to the room’s overall spaciousness. A converted garage keeps the vaulted ceiling for spaciousness while various architectural elements such as the ridge beam increase the room’s character. 6. Temperature control. And don’t forget that the new living area will need to be heated and cooled. Depending on the size of the area and its location, you may not be able to use the existing “central” heating and cooling system. Mini split systems can be good options if this is the case. This post was written by Bud Dietrich AIA, Houzz and posted by RealBird with permission.